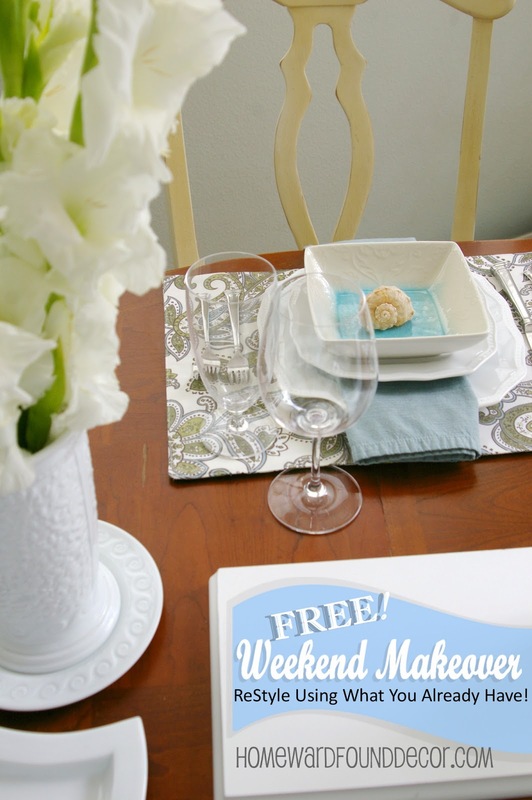 Welcome to Part 3 of my FREE Weekend Makeover! but it's actually part of the main living space. That large modular sofa was blocking it off from being used to all of its potential, though. Here's the other sofa section! The armless unit [from the center of the old 'U'-shaped sofa] has been moved to the dining area. Why? Because it helped open up the living room to get it out of there. And because this wall was screaming for something on it. *You can still see the television from here, so it's a great lounge space. *You can participate in conversations in the living room. which also works well for working on home work or a laptop. by simply scooting one four-foot sofa section across a room! Remember, you have to SEE THINGS DIFFERENTLY! 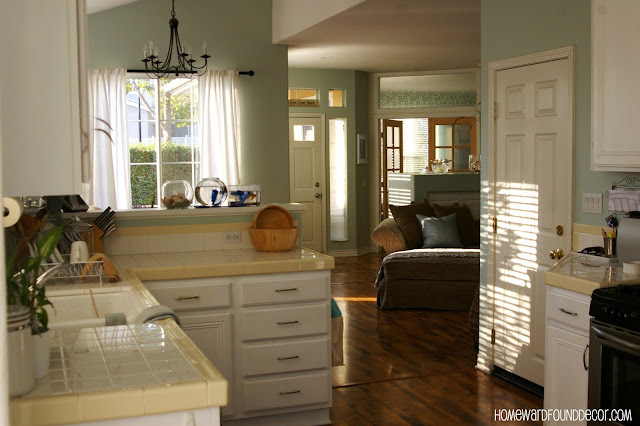 continue reading to see MORE of the dining room - and kitchen! Looking from the kitchen into the Dining Room, it's just a view of a table. And it's long. It's taking up the whole room, but doesn't really fit the space. "When they eat at this table, they are AWFULLY far away from each other." With pre-teen girls in the house, family time is important. So I wanted to help with that. 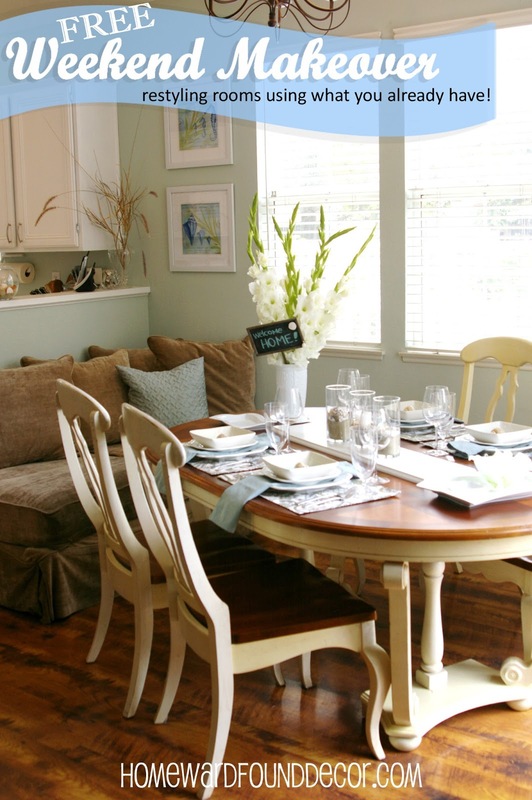 With the four-foot sofa section up against the half-wall, the table had to move down. Rather than just shove it down toward the glass doors, I angled it a bit. and bring an energy to the space. which draws the family closer together at meal time. for the family dog to tuck herself into her second favorite place to lay. it's hung too high, and the black metal kind of stands out a bit too much in this decor. which will make the lighting more effective, and the mood more intimate. 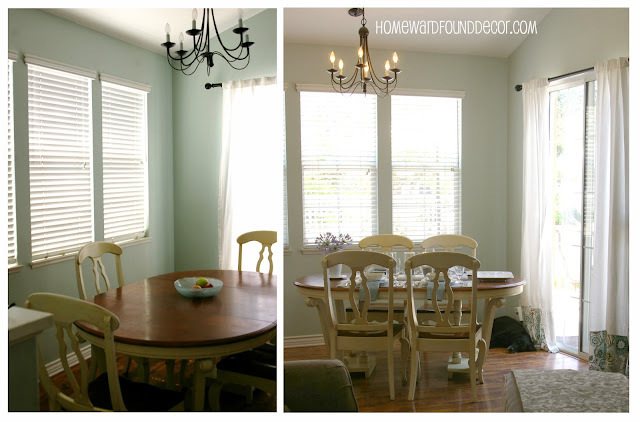 you'll be able to see some 'AFTER After' photos of that chandelier - coming in September! These white gladiolus stems were the ONLY thing I purchased for this makeover. to keep her table [and mantel] looking like this every week. On the CHEAP. * linen napkins folded up in that same buffet drawer. because there were no brackets to hang it up. It creates a pedestal for the shell jars, to make them POP on the table! were in a bag of shells in the 'party decor' box in the garage. I love the way the table turned out. If I win, I'm taking my sister in law out on a shopping spree! OK, this isn't really what it looked like 'before'. There were baskets of papers and envelopes and mail and coupons on the counter 'before'. I cleared the space before I started taking photos. Sorry. 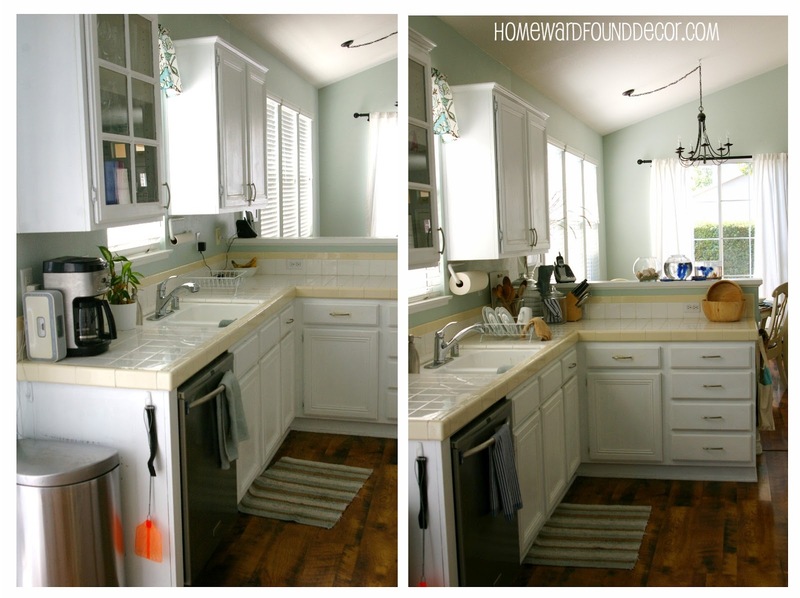 How do you get personality in a kitchen? Use your kitchen tools as decor. uh huh. Two beautiful wooden salad bowls join forces on the countertop to hold fruit - or popcorn! The dish drainer holds a few white everyday dishes, just to look pretty. On the left, the large coffee maker (that was brought out just for me!) was put back in the garage. That opens the counter up and lightens the look. On the ledge in the center, the family fish have taken up residence. The blue faux plants in their bowls coordinate with the decor, and so do they! for messages as family members leave through the garage. these echo the ones used on the mantel in the living room, and also the brown sofa color. and a softball glove - just because. sits behind the iPod docking station and a plant, adding interest without taking up space. 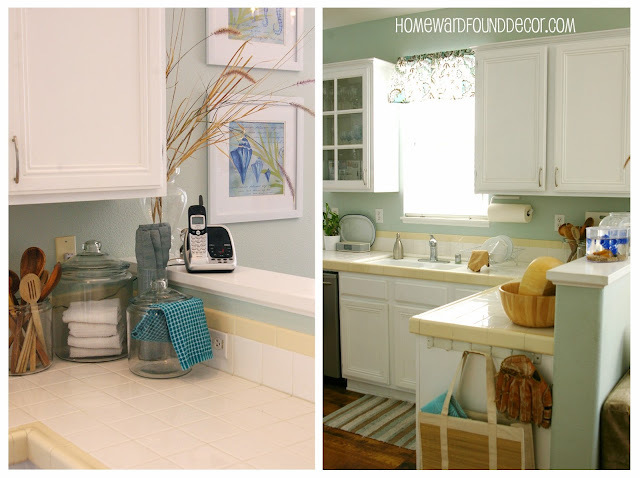 Just think of storing and displaying kitchen tools and implements in new ways. You gotta' use this stuff - but it can still be pretty! I love your after picture! What a change moving in the section from your couch, it now looks so warm and inviting. I hope your family likes it and this look will stay, you did a great job! What?....this is GENIUS! Only YOU would think of dividing up a sectional like that Deb and I love the idea! wonderful use of small space and great fillers!! love it!! 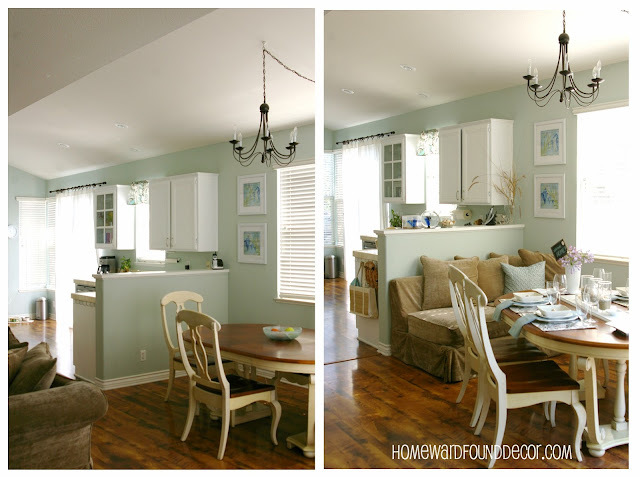 what an incredible change, i love that you used pieces from all different spots in your house. sometimes it does just take a fresh look at something old to find a new spot for it. 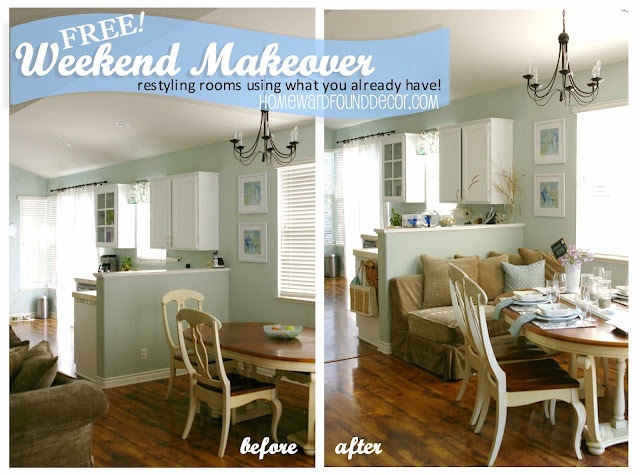 thank you so much for linking up to the before and after party!